This latest edition of Illinois Real Estate Managing Broker Prelicensing can be used to support a managing broker prelicensing course. This textbook provides full coverage of the state’s required topics, including licensing and operations, managing licensees, and risk management. 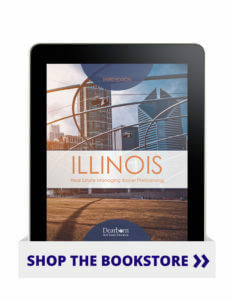 It has updated content that addresses the recent changes in the real estate industry and Illinois laws and rules. An enhanced Instructor Resource Guide is available to prepare for regular classroom instruction, as well as the interactive requirement. Students will learn how to manage a brokerage efficiently, from the recruiting and hiring process through transaction management and dispute resolution. In addition, they will learn how today’s marketing and advertising must follow federal and state laws, but when done correctly can set the brokerage apart from the competition.